Pours an auburn color with a great, big head that lasted well. Aroma is subtle, kinda hoppy with a bit of malt. Not much there for me. Taste was good, but nothing special. Just seemed a bit boring to me. Mouthfeel was light in body with a lot of carbonation. Overall a good, drinkable beer but just not something that grabbed me. Poured a slightly hazy amber with a thick tan head with good lacing and retention. Smell has a nice biscuity maltyness with a light floral hop prescence. Taste is as the smell would advertise, a nice bit of buscuity malts quickly overtaken by a crisp, but not overly strong bit of floral and citrusy hops. Mouthfeel is light and crisp with a touch of hop oilyness. A nice easy to drink session style pale. Sampled from a 12oz bottle. A - Light golden color with lots of sediment and a minimal white head. S - Yeasty at first then that mellows and has more of a malty aroma. T - Balanced flavor with malt, sweetness, bitterness, hops and a little tartness. Fruity as well. M - Low carbonation with good body. D - Very smooth, pleasant and easy to drink. I know it's described as "English-style" on the label, but it's still surprisingly malt forward for a pale ale. Not as balanced (or to my taste) as more hop-forward pale ales. 12oz with notches on the label indicating this was brewed in the third week of Feb.
Light copper with a decent white head that leaves some lace. Good carbonation gives it some retention. Piney/citric hops paired nicely with slightly swet malt make up the nose. Not as strong as others in this style. More hop (oil?) than malts, but it comes close to balance. There's a slight roasted note from the malt that is not out of place, but rather gives this one character. Clean, dry finish. Smooth in the mouth. Good beer for a hot night. Nice copper colored pale ale with good clarity. Lots of bubbles floating up towards a decent white head with some pretty good sticking qualities. Smell is a perfect blend of floral hops and malty sweetness. Taste is mostly dominated by the malts. This is not an overly hoppy pale ale here. 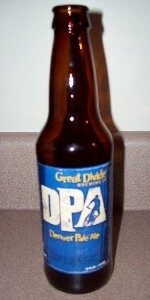 Has some earthy tones mixed in the taste, which I have found to be a staple in most of Great Divide's beers. Mouthfeel is a little thin. I could easily put several of these down on a hot summer day. Morey's Bottom Line: A pretty good Pale, but I tend to like mine a little hoppier. Would be a superb choice to introduce Macro-swillin' friends to the world of craft beer. Appearance: Pours a mostly clear, pale copper body with a sudsy white head. Good lacing, too. Smell: Toasted nuts with a bit of caramel and some light soapy, floral hop notes. Taste: Light caramel malt sweetness with more of those toasted nuts. Hops, though relatively mild, provide flavors of grapefruit and lemon. The taste of pine appears just before the brief, bitter finish. Poured in a Pint Glass. Appearance- Yellowish, orange, amber color with a medium white head and decent carbonation. Taste- Herbal and lemony flavors dominate with the hops playing a reserved staring role. At the end there is a extinguishing almost milky sweet, but not quite, finish. Refreshingly crisp but not bitter. Mouthfeel- Medium bodied and decently lasting. It's a good summer food beer. Drinkability- 3 to 5 wouldn't be a struggle at all to drink. Especially with food and a decently warm day. Appearance: Pours a clear burnt-orange color. Off-white head is foamy but retention is average. Leaves a nice spotty lacing on the glass. Smell: Smells well-balanced, at least. Honey, sweet malts, and floral hops are noted in the aroma. Taste: This beer had potential, and I've liked most Great Divide brews I've had, but the flavor just doesn't do it for me. I like hops but this isn't the clean, fresh taste I was expecting. There's a piney bitterness and hop bite..hoppier than most PAs, but in this brew's case, it isn't really a good thing. Mouthfeel: Relatively light-bodied with a bit of a rough mouthfeel. Decent carbonation. Dry, chalky finish. Drinkability: Good drinkability due to it's light body. I like the 5.6% ABV as well. Overall, this is one of those beer that is nice to try but is easily forgotten. If I was sitting at a Bennigans somewhere, and this was the best beer I could get, I'd be happy enough. But that isn't the case, and I wish for more. I don't mean to be cruel here, but this beer just seems a little too watery, with a hint of the bitterness and an even fainter hint of the hoppiness that I'm lookin' for. Definately a beer in the English Pale tradition. Another boring offering from GD. Could have been something better, but it has a metallic taste and the hops are lifeless, just kind of there. It has a decent mild amber color with a white head. Forget about this beer I know I did. A: Slightly hazy pale amber with moderate carbonation. Fluffy off-white head has good retention and leaves a fair amount of lace. S: Slight grapefruit citrus smell, plus fresh baked biscuits. T: toasted dry malt flavors out front are flanked by a citrus and pepper bitterness. Finishes with a mild citrus bite. M: Medium body has the right amount of fizz. D: Pretty nondescript, but a nice beer overall. I still have a couple more of these left and look forward to drinking them. Poured from a 12oz bottle into a Samuel Adams pint glass. A: Weak yellowish/orange color. Only about a finger of head after a normal pour. Lacing lasted throughout the duration of the beer. S: Malty. Not much else to it. Can't really discern any hops or citrus in it. T: Sweet with relatively nice malt blend. Taste lingers on for a long time after it goes down. M: Medium bodied, lingering aftertaste. Low carbonation, but not underdone. Creamy, yet weak. Immediate mouthfeel reminded me of Saranac which isn't my favorite, but I don't hate it either. D: Eh, I could take it or leave it. Was ok. I would drink it if there were no other craft brew options available.